Our GuildBank is very impressive. 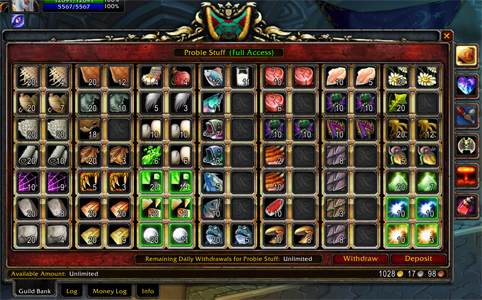 All 6 tabs are chock full of crafting supplies, cloth, leather, food, ore, gems, fish, herbs, enchanting stuff, primals, etc... Our bank policy is very simple, take what you need, fill it up when you can. Below is a current photo of tab 1 (Probie Stuff) that all new members will have access to. Here is how it should be used. If you are working on a crafting skill and only need to make a few more items to get to the skill level you need then take the materials you need from the guild bank. When you are out and about collect the materials you used, (and a few extra) and put them back into the guild bank for others to use. You will notice that every item has two spaces for it, a full stack and the partial stack. If you are depositing, and what you are trying to put in will make the second stack more than a full stack then you keep a full stack and leave the partial stack. Example is if there are 2 stacks of Linen Cloth, one 20 stack and one 18 stack, you have 5 to add to the bank, remove 15 from the partial stack. That will leave a 20 stack, a 3 stack and you will have a 20 stack in your inventory. Take the stack in your inventory and sell it on the Auction House. Deposit all/part of the proceeds into the Guild Bank for others to use for repairs. This may sound confusing at first but feel free to contact one of the Guild Officers for help. Once you understand it, it is really quite simple.